Pseudomonas aeruginosa is a biofilm-forming opportunistic bacterium, which can make critical health problems, particularly in immunosuppressed hosts such as burn patients, patients suffering from respiratory diseases such as cystic fibrosis (CF), and cancer chemotherapy patients., Wound infection by antibiotic-resistant organisms such as P. aeruginosa, Acinetobacter, and Klebsiella should be identified as a potential risk.P. aeruginosa plays a notable role in perilous infections in burn patients. Rapid acquisition of multidrug resistance (MDR) leads to high morbidity and mortality, especially in burn centers.,P. aeruginosa infections are mostly difficult-to-treat because of the low antibiotic sensitivity and the high rate of the emergence of antimicrobial resistance during the process of the treatment., Accumulation of resistance after exposure to various antibiotics and cross-resistance among them may result in MDR, extended drug-resistant (XDR), and pan drug-resistant (PDR).,, The rapid emergence of hospital pathogens and antibiotic-resistant organisms necessitate periodic evaluation of bacterial colonization patterns and antibiogram sensitivity in burn wards. P. aeruginosa is a prevalent biofilm-forming bacterium which hence often used as a model organism in biofilm studies. Biofilm is a complex and compressed microbial community in an exopolysaccharide matrix  and allows bacteria to attach to the surfaces protecting it from environmental fluctuations such as antimicrobial agent.,,,, Mucoid strains of P. aeruginosa produce numerous amounts of the alginate exopolysaccharide which is a significant component of its biofilm. Alginate is a linear heteropolysaccharide formed of D-mannuronic acid and L-glucuronic acid. There are two different hypotheses that antibiotic resistance is different between mucoid and nonmucoid P. aeruginosa strains; first, glycocalyx can act as a barrier to antibiotic diffusion which is related to its polyanionic properties;,, the second has revealed that some antibiotics such as tobramycin (TN) can bind to exopolysaccharide and penetrate inside bacteria. The purpose of the current study was to determine alginate/biofilm production, antibiotic susceptibility pattern, and frequency of MDR and XDR in P. aeruginosa isolated in Imam Musa Kazem Burn Hospital in Isfahan, Iran. In this cross-sectional study, 100 isolates of P. aeruginosa have been gathered from wound infections of burn patients admitted to Imam Mosa Kazem Burn Hospital in Isfahan, Iran, between March and July 2015. Each isolate has been determined due to the standard bacteriological methods including Gram-staining, growth at 42°C in cetrimide agar, oxidation-fermentation (OF), TSI, and oxidase tests. Furthermore, polymerase chain reaction (PCR) of exoA gene has been carried out to confirm the bacteriologic identification. 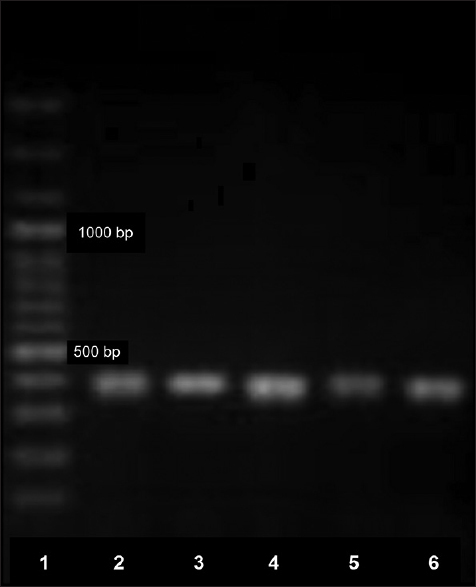 A 397-bp fragment of the exoA gene has been selected with specified primers (forward: 5'-GACAACGCCCTCAGCATCACCAGC-3,' reverse: 5'-CGCTGGCCCATTCGCTCCAGCGCT-3'). Each PCR reaction was prepared in 20 μL volume include 10 μL the commercial Master Mix (containing Taq DNA polymerase, dNTPs, and MgCl2) (Ampliqon Denmark), 1 μL DNA sample, 0.5 μL of each primer (Metabion, Germany), and 8 μL distilled. Samples were then subjected to one cycle of 95°C for 3 min, followed by 35 cycles of 95°C for 30 s, 68°C for 30 s, and 72°C for 45 s and one final cycle of 72°C for 5 min. P. aeruginosa strain ATCC27853 (American Type Culture Collection) was included as the control. Mucoid strains have been determined by the use of Anthony's capsule staining as the qualitative method. Briefly, for each of 100 isolates, a thin film of skim milk suspension has been prepared and air-dried; the film has been flooded with crystal violet for 60 s. The slide has been gently rinsed with a 20% copper sulfate solution for capsule decolonization. The cell and background have been stained purple, and the capsule appears as a faint blue halo. The P. aeruginosa isolates have been analyzed to quantify biofilm production using microtiter dish method. In this method, each strain has been grown overnight at 37°C in tryptic soy broth (TSB) including 0.25% glucose. The cultures have been diluted 1:100 in TSB medium. The bacteria suspensions (125 μL) have been aliquoted into a 96-well polystyrene microtiter plate and inoculated for 24 h at 37°C without agitation. The wells have been washed three times with 300 μL distilled water; the attached bacteria have been fixed with absolute methanol for 10 min and finally stained with 125 μL of 0.1% crystal violet solution in water for about 10–15 min. After staining, the wells have been washed three times with distilled water to remove all nonadherent cells. The wells were destained with 125 μL of 30% acetic acid in water. A new sterile flat-bottomed 96-well polystyrene microtiter plate was inoculated with 125 μL destaining solution in each well. The absorbance of the destaining solution has been measured at 570 nm using an ELISA reader (Stat Fax-2100). Every experiment has been carried out in triplicate. As the control, the uninoculated medium was used. According to the optical density of each sample (ODi) and the negative control (ODc), the isolates have been categorized as strong (4× ODc < ODi), moderate (2× ODc < ODi ≤ 4× ODc), weak (ODc < ODi ≤ 2× ODc), or nonproducer of biofilm (ODi < ODc). Agar diffusion methods (Kirby–Bauer method) have been applied to determine the antibiotic susceptibility of isolated bacteria against TN (10 μg), aztreonam (ATM, 30 μg), imipenem (IMI, 10 μg), ceftazidime (CAZ, 30 μg), levofloxacin (LEV, 5 μg), piperacillin-tazobactam (PTZ, 110 μg), and polymyxin B (PB, 300U). MDR, XDR, and PDR strains have been detected according to a new standardized international document.P. aeruginosa (ATCC 27853) was used as a control strain. Statistical Package for Social Sciences software (SPSS Inc. No. 23, Version 23.0. Armonk, NY: IBM Corp.) was used for statistical analyses. Fisher's exact test or Chi-square test was used for the categorical data analysis. P < 0.05 was considered statistically significant. One hundred P. aeruginosa have been isolated from burn wounds. The isolates were Gram-negative, growing at 42°C, OF, TSI and oxidase-positive. The identification of the isolates has been confirmed by amplification of exoA gene which particularly belongs to P. aeruginosa [Figure 1]. All the isolates carried the exoA gene. The antibiotic susceptibility patterns of the P. aeruginosa isolates are shown in [Table 1]. A high rate of resistance has been observed against IMI, TN, and LEV (approximately 90%), ATM (87%), PTZ (85%). The lowest and medium resistances have been observed to PB (2%) and CAZ (32%), respectively. Totally, MDR and XDR isolates were 19% and 75%, respectively. PDR strain has not been observed. Mucoid strains were determined in all isolates as an alginate producer by capsule stain method (qualitative methods). Ninety-three percent of the isolates indicated biofilm formation. In addition, microtiter method was conducted as a quantitative assessment of biofilm production. The results have been shown that 7% of isolates were nonbiofilm (N), weak (W) 67%, moderate (M) 22%, and strong (S) 4%. The relation between the biofilm formation and the antibiotic susceptibility patterns is shown in [Table 2] (P< 0.05). In P. aeruginosa infections, alginate/biofilm production has been measured as an important determinant of pathogenicity. Mucoid strains of P. aeruginosa produce vast levels of the alginate considered the main component of its biofilm. In the present study including P. aeruginosa isolated from burn patients, we assess presence and rate of the alginate as a virulence marker and determine the frequency of MDR and XDR strain. In some surveys, mucoid strains were lower than our result. According to the findings of Kádár et al. in 2010, 23.3% of sixty clinical samples of P. aeruginosa were positive for biofilm formation. In another study performed by Ghadaksaz et al. in Iran, the frequency of biofilm formation was 50.1% among 104 clinical isolates of P. aeruginosa. In a study conducted at Manipal, 68% of P. aeruginosa strains produced alginate. The results mentioned above have shown that mucoid strains have lately increased in comparison with previous studies in Iran and another country. Quantitative biofilm determination by the use of the microtiter test showed that 93 strains produced biofilm, which 67 samples were weak biofilm producers, 22 samples were moderate, and four samples were strong. In a study performed by Jabalameli et al., biofilm production has been observed in more than 96% of the isolates which 22.9% were weak biofilm formers, 26% were moderate, and 47% were strong. According to the earlier studies, it has been thought that antibiotic susceptibility is different between mucoid and nonmucoid P. aeruginosa strains.,, In many literature, there are challenges about whether the mucoid phenotype leads to increased resistance. One hypothesis suggests that the glycocalyx usually acts as a polyanionic barrier to antibiotic penetration.,, This was refuted by the fact that although some antibiotics such as TN bind to the exopolysaccharide, the resulting reduction in the diffusion coefficient of antibiotic in a biofilm would not be enough to prevent the entry of antibiotics. In contrast, several studies suggest that mucoid strains are more sensitive to some antibiotic than nonmucoid strain., For example, in Shawar et al. 's study of inhaled-TN therapy examined the susceptibility of 1240 CF isolates, it found that for all seven antibiotics tested, mucoid strains were more susceptible in comparison with nonmucoid strains. Furthermore, an important finding in Burns et al. 's study was that overall and for each drug tested, mucoid isolates were more susceptible. As a result, it can be concluded that the rate of MDR in Iran is higher than other countries. The results of antibiogram showed that PB and CAZ were the most effective drugs against P. aeruginosa in vitro, but the high speed of increased resistance might lead to the emergence of the PDR strains, which is a serious warning to our country. The increased rate of MDR/XDR P. aeruginosa isolates can cause limitations in antibiotic therapy as a final strategy to treat the infections. Therefore, it is important to investigate the antibiotic susceptibility pattern of P. aeruginosa isolates. There was no relationship between the patterns of biofilm production and antibiotic susceptibility, but high frequency of MDR/XDR and biofilm producer strains has been detected. This study was supported by Isfahan University of Medical Science, Grant no. 394656. Rezaee MA, Behzadiyan-Nejad Q, Owlia P, Pirayeh SN. In vitro activity of imipenem and ceftazidim against mucoid and non-mucoid strains of Pseudomonas aeruginosa isolated from patients in Iran. Arch Iran Med. 2002;4:251-4. Ugargol AR, Srikanth N, Shilpa K, Patil S. Characterisation and detection of virulence factors, alginate and phospholipase 'C' in Pseudomonas aeruginosa in a Tertiary Care Hospital. Int J Health Sci Res 2014;4:82-7. Japoni A, Alborzi A, Kalani M, Nasiri J, Hayati M, Farshad S. Susceptibility patterns and cross-resistance of antibiotics against Pseudomonas aeruginosa isolated from burn patients in the South of Iran. Burns 2006;32:343-7. Moghoofei M, Fazeli H, Poursina F, Nasr Esfahani B, Moghim S, Vaez H, et al. Morphological and bactericidal effects of amikacin, meropenem and imipenem on Pseudomonas aeruginosa. Jundishapur J Microbiol 2015;8:e25250. Aloush V, Navon-Venezia S, Seigman-Igra Y, Cabili S, Carmeli Y. Multidrug-resistant Pseudomonas aeruginosa: Risk factors and clinical impact. Antimicrob Agents Chemother 2006;50:43-8. Vaez H, Faghri J, Isfahani BN, Moghim S, Yadegari S, Fazeli H, et al. Efflux pump regulatory genes mutations in multidrug resistance Pseudomonas aeruginosa isolated from wound infections in Isfahan hospitals. Adv Biomed Res 2014;3:117. Shu JC, Chia JH, Siu LK, Kuo AJ, Huang SH, Su LH, et al. Interplay between mutational and horizontally acquired resistance mechanisms and its association with carbapenem resistance amongst extensively drug-resistant Pseudomonas aeruginosa (XDR-PA). Int J Antimicrob Agents 2012;39:217-22. Dobbin C, Maley M, Harkness J, Benn R, Malouf M, Glanville A, et al. The impact of pan-resistant bacterial pathogens on survival after lung transplantation in cystic fibrosis: Results from a single large referral centre. J Hosp Infect 2004;56:277-82. Hammond AA, Miller KG, Kruczek CJ, Dertien J, Colmer-Hamood JA, Griswold JA, et al. An in vitro biofilm model to examine the effect of antibiotic ointments on biofilms produced by burn wound bacterial isolates. Burns 2011;37:312-21. Byrd MS, Pang B, Hong W, Waligora EA, Juneau RA, Armbruster CE, et al. Direct evaluation of Pseudomonas aeruginosa biofilm mediators in a chronic infection model. Infect Immun 2011;79:3087-95. Kennedy P, Brammah S, Wills E. Burns, biofilm and a new appraisal of burn wound sepsis. Burns 2010;36:49-56. Charlesworth CJ, Saran VV, Volpiana LK, Woods HL. The role of biofilm structure in the mechanism of gentamicin and ciprofloxacin antibiotic resistance in P. aeruginosa PAO1 biofilms. J Exp Microbiol Immunol 2008;12:27-33. Cotton LA, Graham RJ, Lee RJ. The role of alginate in P. aeruginosa PAO1 biofilm structural resistance to gentamicin and ciprofloxacin. J Exp Microbiol Immunol 2009;13:58-62. Lawley R, Curtis L, Davis J. The food safety hazard guidebook: Royal Society of Chemistry; 2012. Hengzhuang W, Song Z, Ciofu O, Onsøyen E, Rye PD, Høiby N. OligoG CF-5/20 Disruption of mucoid Pseudomonas aeruginosa biofilm in a murine lung infection model. Antimicrob Agents Chemother 2016;60:2620-6. Wood LF, Leech AJ, Ohman DE. Cell wall-inhibitory antibiotics activate the alginate biosynthesis operon in Pseudomonas aeruginosa: Roles of sigma (AlgT) and the AlgW and Prc proteases. Mol Microbiol 2006;62:412-26. Ahangarzadeh RM, Behzadiannezhad Q, NAJJAR PS, Oulia P. Higher aminoglycoside resistance in mucoid Pseudomonas aeruginosa than in non-mucoid strains. Arch Iranian Med. 2002;5:108-10. Slack MP, Nichols WW. Antibiotic penetration through bacterial capsules and exopolysaccharides. J Antimicrob Chemother 1982;10:368-72. Costerton JW, Irvin RT, Cheng KJ. The bacterial glycocalyx in nature and disease. Annu Rev Microbiol 1981;35:299-324. Diaz E, Haaf H, Lai A, Yadana J. Role of alginate in gentamicin antibiotic susceptibility during the early stages of Pseudomonas aeruginosa PAO1 biofilm establishment. J Exp Microbiol Immunol 2011;15:71-8. DeVries CA, Ohman DE. Mucoid-to-nonmucoid conversion in alginate-producing Pseudomonas aeruginosa often results from spontaneous mutations in ALGT, encoding a putative alternate sigma factor, and shows evidence for autoregulation. J Bacteriol 1994;176:6677-87. Khan AA, Cerniglia CE. Detection of Pseudomonas aeruginosa from clinical and environmental samples by amplification of the exotoxin A gene using PCR. Appl Environ Microbiol 1994;60:3739-45. Prescott LM, Harley JP, Klein D. Microbiology. Dubuque, Iowa: Wm. C. C Brown; 1996. O'Toole GA. Microtiter dish biofilm formation assay. J Vis Exp 2011. pii: 2437. Choy MH, Stapleton F, Willcox MD, Zhu H. Comparison of virulence factors in Pseudomonas aeruginosa strains isolated from contact lens- and non-contact lens-related keratitis. J Med Microbiol 2008;57(Pt 12):1539-46. Ghanbarzadeh Corehtash Z, Khorshidi A, Firoozeh F, Akbari H, Mahmoudi Aznaveh A. Biofilm formation and virulence factors among Pseudomonas aeruginosa isolated from burn patients. Jundishapur J Microbiol 2015;8:e22345. Jabalameli F, Mirsalehian A, Khoramian B, Aligholi M, Khoramrooz SS, Asadollahi P, et al. Evaluation of biofilm production and characterization of genes encoding type III secretion system among Pseudomonas aeruginosa isolated from burn patients. Burns 2012;38:1192-7. Kádár B, Szász M, Kristóf K, Pesti N, Krizsán G, Szentandrássy J, et al. In vitro activity of clarithromycin in combination with other antimicrobial agents against biofilm-forming Pseudomonas aeruginosa strains. Acta Microbiol Immunol Hung 2010;57:235-45. Ghadaksaz A, Fooladi AA, Hosseini HM, Amin M. The prevalence of some Pseudomonas virulence genes related to biofilm formation and alginate production among clinical isolates. J Appl Biomed 2015;13:61-8. Prasad SV, Ballal M, Shivananda PG. Slime production a virulence marker in Pseudomonas aeruginosa strains isolated from clinical and environmental specimens: A comparative study of two methods. Indian J Pathol Microbiol 2009;52:191-3. Prince AA, Steiger JD, Khalid AN, Dogrhamji L, Reger C, Eau Claire S, et al. Prevalence of biofilm-forming bacteria in chronic rhinosinusitis. Am J Rhinol 2008;22:239-45. Coban AY, Ciftci A, Onuk EE, Erturan Z, Tanriverdi Cayci Y, Durupinar B. Investigation of biofilm formation and relationship with genotype and antibiotic susceptibility of Pseudomonas aeruginosa strains isolated from patients with cystic fibrosis. Mikrobiyol Bul 2009;43:563-73. Hou W, Sun X, Wang Z, Zhang Y. Biofilm-forming capacity of Staphylococcus epidermidis, Staphylococcus aureus, and Pseudomonas aeruginosa from ocular infections biofilm-forming capacity of human flora bacteria. Invest Ophthalmol Vis Sci 2012;53:5624-31. Srifuengfung S, Tiensasitorn C, Yungyuen T, Dhiraputra C. Prevalence and antimicrobial susceptibility of Pseudomonas aeruginosa mucoid and non-mucoid type. Southeast Asian J Trop Med Public Health 2004;35:893-6. Shawar RM, MacLeod DL, Garber RL, Burns JL, Stapp JR, Clausen CR, et al. Activities of tobramycin and six other antibiotics against Pseudomonas aeruginosa isolates from patients with cystic fibrosis. Antimicrob Agents Chemother 1999;43:2877-80. Nichols WW, Dorrington SM, Slack MP, Walmsley HL. Inhibition of tobramycin diffusion by binding to alginate. Antimicrob Agents Chemother 1988;32:518-23. Abidi SH, Sherwani SK, Siddiqui TR, Bashir A, Kazmi SU. Drug resistance profile and biofilm forming potential of Pseudomonas aeruginosa isolated from contact lenses in Karachi-Pakistan. BMC Ophthalmol 2013;13:57. Owlia P, Nosrati R, Alaghehbandan R, Lari AR. Antimicrobial susceptibility differences among mucoid and non-mucoid Pseudomonas aeruginosa isolates. GMS hygiene and infection control. 2014;9(2). Burns JL, Saiman L, Whittier S, Larone D, Krzewinski J, Liu Z, et al. Comparison of agar diffusion methodologies for antimicrobial susceptibility testing of Pseudomonas aeruginosa isolates from cystic fibrosis patients. J Clin Microbiol 2000;38:1818-22. Shahcheraghi F, Feizabadi MM, Yamin V, Abiri R, Abedian Z. Serovar determination, drug resistance patterns and plasmid profiles of Pseudomonas aeruginosa isolated from burn patients at two hospitals of Tehran (IRAN). Burns 2003;29:547-51. Nikbin VS, Abdi-Ali A, Feizabadi MM, Gharavi S. Pulsed field gel electrophoresis & plasmid profile of Pseudomonas aeruginosa at two hospitals in Tehran, Iran. Indian J Med Res 2007;126:146-51. Ghazi M, Khanbabaee G, Fallah F, Kazemi B, Mahmoudi S, Navidnia M, et al. Emergence of Pseudomonas aeruginosa cross-infection in children with cystic fibrosis attending an Iranian referral pediatric center. Iran J Microbiol 2012;4:124-9. Yousefi S, Nahaei M, Farajnia S, Ghojazadeh M, Akhi M, Sharifi Y, et al. Class 1 integron and imipenem resistance in clinical isolates of Pseudomonas aeruginosa: Prevalence and antibiotic susceptibility. Iran J Microbiol 2010;2:115-21. Shahcheraghi F, Badmasti F, Feizabadi MM. Molecular characterization of class 1 integrons in MDR Pseudomonas aeruginosa isolated from clinical settings in Iran, Tehran. FEMS Immunol Med Microbiol 2010;58:421-5.